Isn't it funny how sometimes our kids can teach us the biggest lessons? Earlier this week I was having kind of a "down" day. I wasn't in the best mood, Dave was going to be working that night and I was flying solo from after school through bedtime and, honestly, I didn't have the best attitude about the whole thing. I was going through homework folders, sorting papers and prepping dinner when Mason kept insisting that I come into my bedroom because he "saw something on my pillow". I was not super receptive to interrupting what I was doing and grumbly made my way to the bedroom to pretty much just get him to stop pestering me about it (insert #momguilt here). I went into the bedroom and there he was, standing all sneaky yet proud next to my bed where there was a little piece of paper all folded up. "Look mom... where do you think this could have come from???" And just like that my day turned around. Seriously. A surprise note from my six-year old readjusted my attitude, refocused my perspective and drowned out a lot of the negative that had been floating around in my head after a long day. I asked him what prompted the note and he told me that in his class they were talking about being an ELF... an "extra loving friend" and how they could show Christ's love to others through "secret missions" like sitting next to someone new at lunch, reading to a younger child, and writing kind words to their friends, parents, teachers, cafeteria workers, etc. I think that sometimes I get caught up in the "grand gestures" when in reality a few genuine and kind words were just as, if not more, effective. I felt really convicted about how something so simple made such a big impact in my day and so I've been thinking of a few easy ways I could share kind words with those around me to encourage and maybe be that turning point in someone's day as well. - Write notes to my kids and leave them in their lunch boxes, school folders, on their mirror, etc. - Send more snail mail! To my friends, to my family to my co-workers. - Committing to sending more positive emails to parents of my students at school. 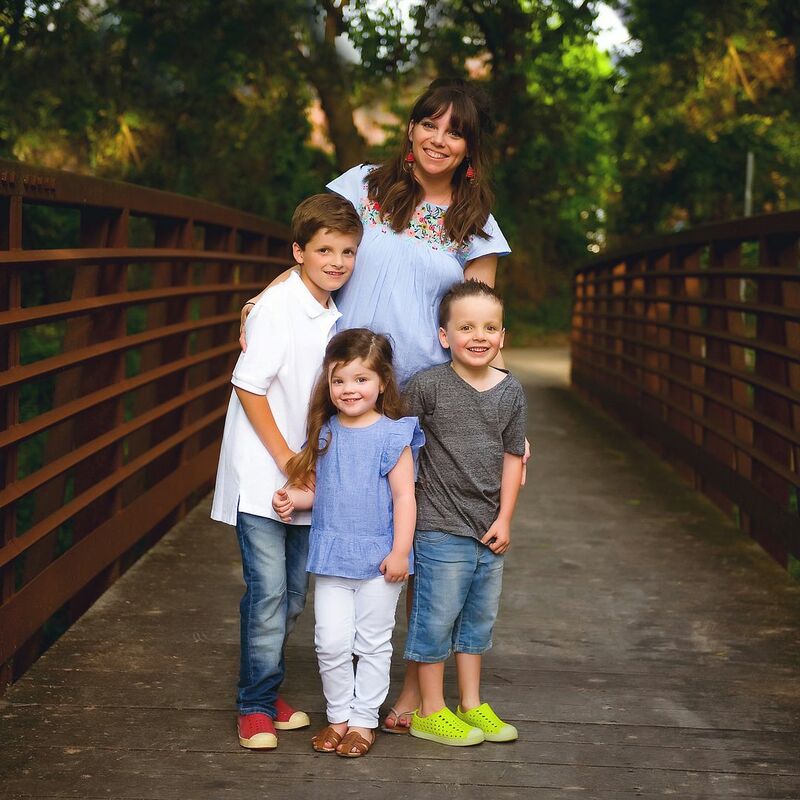 I know how much it means to me as a parent when I hear something positive about one of my kids, so I'm going to try to send a couple every day. - Happy stickies :) I used to do this all the time, but I'm going to make a point to write something nice on a sticky note and attach them to homework papers before I return them to kids with a goal of every kid getting one over the course of a couple of weeks. I adore his teacher for lots of reasons, but her emphasis on showing kindness to others is one of the big ones. My personal "theme" for 2018 is going to be "kind words" and I have sweet Mason to thank for the inspiration :) I'd love to know ways that you spread kindness and/or what your personal mantra is for 2018. This is so good! And such a lovely reminder that how you treat people during the day...even in the smallest ways...really does make a huge difference! I jot names on my calendar near holidays for friends whose loved one has passed away during the year & send handwritten notes throughout the year. 20+ years ago I️ had shared dessert with a family I️ really didn’t know that well. When I️ left that evening there was a small note - not fancy, probably on a sticky - saying “thank you for sharing” it was so convicting to me and I️ have tried to do the same for others since then. What stands out to me the most (someone who is a perfectionist)is that it wasn’t a pretty, elaborate card...it wasn’t super long and gushing...just something simple on a notepad that made me feel valued. It really *is* the little things....thank you for sharing your family’s heart. LOVE THIS!!! 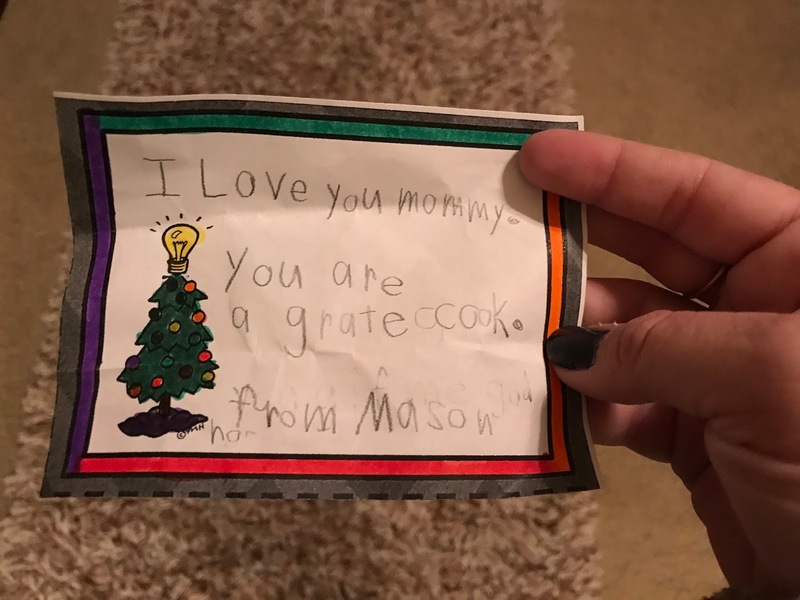 Thank you, Mason, for the reminder! what a great moment and wonderful lesson from your 6 yr old! They are always teaching us something new! Thanks for the inspiration, kind words and gestures! Well, I promptly got up before finishing this post and wrote a sticky note of encouragement to my 16 year old and put it on her mirror! What a great thing! This may sound a little silly but Eye Contact. If you start to pay attention you'll realize how many people at cashier counters or drive thrus or other places that you interact with but don't make eye contact. Looking someone in their eyes and giving them a smile goes such a long way. I hope someone tries it today! Ah! I just love me some Mason!!! I love the thought of ELF. Not only a good reminder for kids, but for us adults as well. As we get older, it is sometimes harder to be that friend for others. This is such a great reminder! And, how sweet of Mason!! That's one sweet boy you have. I think he gets it from his momma:). This is what I needed today. Please thank Mason for me. And, I thank you for sharing and reminding me of how big the little things are. Thank you so much for sharing this today. After a very difficult few weeks of parenting my pre-teens and an easily offended husband this is just what I needed. Maybe if I change my attitude and be more intentional with kind words, the whole household will make a turn for the better...just in time for Christmas. I love this idea! Such a good lesson for young and old. I think 2018 will be the year of kindness for us. So precious!!! What an inspiration your sweet Mason is to all of us! This is such a good reminder!!! Leave it to a child to teach such a simple yet profound lesson. I'm going to try and be an ELF this coming year! So a sweet post. Kids are great at teaching lessons and help us not to be so selfish or grumpy. My kids smooth the edges for sure. ELF is something we all can take and use!! Love that sweet heart of your boy Mason!! I love this! Thanks so much for this reminder! I went to a womens conference recently and the preacher talked about how she kept a gratitude journal. She wrote something down every day for years until she hit 1,000 and she said looking back she could see when times were tough and how hard it was to find gratitude in the little things. You don't have to have something elaborate to be grateful for but putting that practice into your daily routine helped her to appreciate the little things. I started this past month and I must say it's been very therapeutic for me. I keep a small journal in my purse at all times. Merry Christmas! What a great reminder! Thanks for this post! I love the ideas you share of things your kids do at school. Mine go to a christian school too and I share some of the fun things you tell us about. We are doing secret reader now and I shared the ELF with our teacher. My son is 10 and hanging on to "believing" as long as he can. His friends don't believe and he struggles with giving up on the fun magical stuff. But this maybe a good lesson for him to hear. I want to cry. This is the sweetest thing I have seen in a long time. Thank you Mason for the reminder! I LOVE the idea of ELF!!!! may I share this idea?????? Both of my parents are the BEST at writing my brothers and I notes and leaving little words of encouragement on our desks and dressers before a test or when they know we have had a tough week and often, just out of the blue. I think it is a great goal for you to have for yourself to be more intentional with writing your kids notes. Also, every birthday morning, we wake up to the house decorated with streamers hanging from our door and signs posted in our room, bathroom and near other common/popular areas where we hang, so for my brother it is the piano and for me it's ny where I hang my coat and purse in the laundry room. The signs rhyme and have something fun about our age or the year we were born, interests and relevant things in our life (so last year when I was taking my first semester of Spanish, I had a sign that said Feliz cumpleanos instead of happy birthda). When our friends come over and see the signs, they think it is the coolest thing. Just wanted to offer that as a suggestion (you may already do something similar) as a way to surprise your sweet kiddos. Especially since their bdays are all so close- it is fun and very personal to each of them and their personalities. Now that I have gone to college, my mom makes we welcome home signs even when I am just here for the weekend haha! As you can see, my family is ALL about the sweet notes and signs. Love that you are starting that too! Thank you for the reminder and a great start to my day. That is precious and such a wonderful idea! Going to tuck this idea away for my kids and the kids I teach at church. Loved seeing that sweet note. My "kids" are 25 and 27.... so hold on to those precious magic moments. As I sort out closets/extra empty bedrooms now - oh the joy when I come across those little notes from years ago. (Saved everyone of them!) Merry Merry Christmas! I loved that your young son is so thoughtful and kind. What a great inspiration for other to follow! I plan to use this the coming week in my classroom. My 2nd graders are really struggling with saying nice things to each other. We just wrote a "If I Were and Elf" story and this would fall into it perfectly! Please let Mason's teacher know how much we other teachers appreciate a simple way to help our littles make other people feel so special. Have a lovely holiday! What a kind, sweet boy! This is a precious post! We love spreading love with stickies and one year went up to the school super early on the first day and added notes to all the mirrors in all the teacher restrooms and on doors in the lounge areas. I could not even believe as I visited the school throughout the entire year how many were left in place! It definitely spoke to a 4th graders heart to see here words mattered. I love keeping sonic or chick fil a gift cards in my purse ($5) to randomly hand out to cashiers or the cart guys at the grocery store....they are always just so blown away when I thank them and hand them the card.